"Evitiam che un domestic allora, questo odor "
"O, siete qui, mio Gil? " "Via così non mi lasciate "
"Che palpiti, che palpiti! " "Ti colgo questa volta! " CD 31: Mahler: Symphony No.2 - "Resurrection"
CD 32: Beethoven: Symphony No.9 - "Choral"
CD 39: Hérold: La Fille mal Gardée; Gounod: Ballet Music From "Faust"
3. Pour l'expression et le "sostenuto"
Symphony No.2, Op. 9, "Antar"
. . . the sound of Fistoulari's highlights from Tchaikovsky's "Swan Lake" holds up stunningly (recorded with the Concertgebouw Orchestra in 1961), not to mention Solti's visceral Mahler Resurrection Symphony with Heather Harper, Helen Watts and the London Symphony Orchestra and Chorus from 1966 . . . the clarity and presence of the two opera sets is undeniable -- and what performances! Serafin conducts "La Bohème" with Tebaldi and Bergonzi, and Karajan conducts Tebaldi and Del Monaco in Verdi's "Otello", both tremendously exciting. There are too many highlights to list . . .
. . . [this collection] spans the label's stereo high points . . . the two-channel versions vivify and expand the orchestral image as if a large room's doors were opened to let fresh air in for the first time . . . Each volume is housed in an original sleeve facsimile, with bonus material frequently and generously expanding upon the original LP programmes . . . [and] whoever pitched Lamberto Gardelli's effervescent recording of Wolf-Ferrari's "Il segreto di Susanna" for inclusion is a genius . . . It's nice to have the Schmidt-Isserstedt Vienna Beethoven Ninth Symphony back in circulation; its dream-team vocal quartet (Sutherland, Horne, King and Talvela) may be the stereo era's finest. The collection adds up to a well-rounded, high-quality set of orchestral, choral, operatic, chamber and solo instrumental works that will make a perfect gift for any classical music newcomer. A lot of these discs sound more like SACDs than standard-issue stuff. They have huge dynamic range, tonal beauty, and a wide, deep soundstage . . . This collection contains some of the greatest conductors . . . leading some of the greatest orchestras . . . with solos from some of the greatest musicians. (Check out Kyung Wha Chung playing the Stravinsky violin concerto under André Previn and the London Symphony.) Buy this! A superb collection that documents Decca's mastery of the recording art . . . What a treat this 54-disc CD set is from Decca Records . 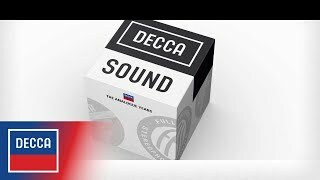 . . really a thrill that Decca has put together this wonderful box set . . . Of course good sound doesn't mean much without the right artists, and Decca was lucky to have conductors like Ansermet, Haitink, Dutoit, Dorati and Monteux . . . One can marvel at the Decca sound, and some of these discs sound as good as some modern SACDs . . . I totally enjoyed the Sibelius Symphony no. 1, The Verdi Requiem conducted by Solti, and a few of the Scriabin selections. Whatever Decca figured out about audio, they were certainly doing something right. There is not a bad or even average recording in the set. Equally interesting is the included large booklet, that goes into detail on Decca's recording philosophy and the equipment they used . . . It's the best deal I've seen that combines musical and audio quality . . . The Decca set is an absolute treasure. My highest recommendation. This is one of the most exacting multi-disk sets one will ever experience . . . we can be thankful for the many treasures here. I owned most of these recordings when originally issued, and there is no question that the superb original recordings now sound better than ever in their digital remastering . . . No question, this is an essential set for collectors. Get this limited edition while you can. And thank you DECCA!!! !